This multimedia resource offers you all the how-to step-by-step guidance you need to perform all of the latest and best techniques in foot and ankle surgery. The complete, lavishly illustrated volume is made even better with a state-of-the-art companion web site! Large full-color intraoperative photos, diagrammable illustrations, dedicated website, and companion DVD demonstrate procedures. This concise, accessible multimedia resource shows you what you need to know and how to do it all. The result is a detailed, easy-to-use reference that no orthopedic surgeon should be without. This is a title in the Operative Techniques series. Please visit www.operativetechniques.com for more information. Includes full-text web access so you can search the text online, view surgical video clips that let you see the experts perform the techniques and perfect your own, and use reference links for further research on the procedures. Discusses pearls and pitfalls with an emphasis on optimizing outcomes to improve the quality of your technique and learn the expert’s approach to getting the best results. Outlines positioning, exposures, instrumentation, and implants to give you a step-by-step guide for every procedure. Provides discussions of post-operative care and expected outcomes, including potential complications and brief notes on controversies and supporting evidence to give you important details about patient-focused surgery. Highlights key anatomies with color photos and illustrations as well as diagrams that present cases as they appear in real life to help you see every detail with clarity. 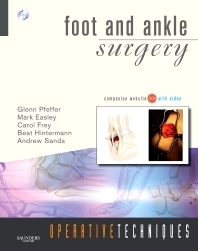 Features a DVD with an hour of video clips of procedures to help you refine your technique.